If you’ve delayed seeking dental care due to anxiety, we understand. Perhaps you had a negative experience that left you too nervous to see the dentist regularly, a severe gag reflex, or a medical condition that prevented you from getting routine dental care. Sometimes, dental anxiety can be so debilitating that it prevents a patient from seeking necessary dental treatment. As a result, their oral health can decline which also affects their overall wellbeing. Fortunately, we offer solutions to help you get the care you need comfortably. Also known as “sleep dentistry,” IV sedation involves the intravenous administration of sedative drugs. It’s one of the most advanced forms of sedation available today; however, unlike a general anaesthetic, IV sedation places you in a conscious, yet profoundly calm and dreamlike state. You won’t need to be hospitalised. 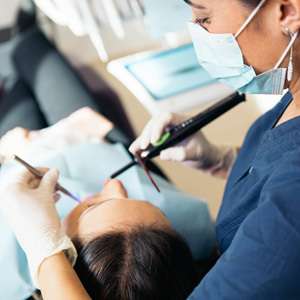 The sedation can be performed right here in our practice by a registered dental sedationist. We offer intravenous sedation in our rooms, with a specialist anaesthetist and a registered nurse in attendance. A primary benefit of sleep dentistry is it allows you to get many different dental treatments completed in just one appointment—a big time saver. If you’ve put off getting the dental care you want or need due to dental anxiety, contact us today to schedule a consultation. Dr Zina and our friendly team look forward to helping you.